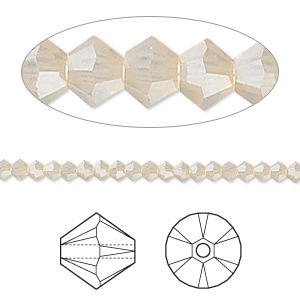 Bead, Swarovski® crystals, Crystal Passions®, sand opal, 3mm Xilion bicone (5328). Sold per pkg of 48. Beige tones and milky shades with coppery-yellow flashes of "sunlight" evoke images of sandy beaches at sunrise in every precision-faceted crystal. Similar to the Swarovski® crystal light grey opal, but with warm yellow tones instead of golden. Swarovski® crystal components are made in Austria and are considered the finest products of their kind in the world.